The Emancipation Proclamation in 1863 freed African Americans in rebel states, and after the Civil War, the Thirteenth Amendment emancipated all U.S. slaves wherever they were. As a result, the mass of Southern blacks now faced the difficulty Northern blacks had confronted-that of a free people surrounded by many hostile whites. One freedman, Houston Hartsfield Holloway, wrote, "For we colored people did not know how to be free and the white people did not know how to have a free colored person about them." Even after the Emancipation Proclamation, two more years of war, service by African American troops, and the defeat of the Confederacy, the nation was still unprepared to deal with the question of full citizenship for its newly freed black population. 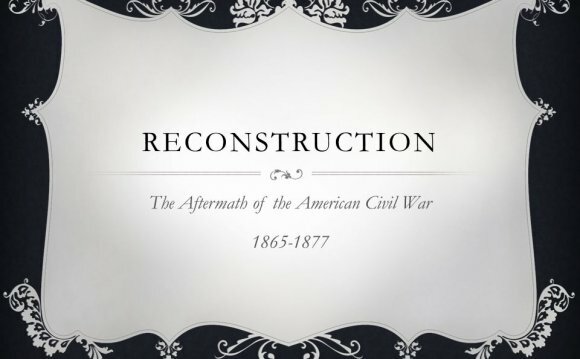 The Reconstruction implemented by Congress, which lasted from 1866 to 1877, was aimed at reorganizing the Southern states after the Civil War, providing the means for readmitting them into the Union, and defining the means by which whites and blacks could live together in a nonslave society. The South, however, saw Reconstruction as a humiliating, even vengeful imposition and did not welcome it. During the years after the war, black and white teachers from the North and South, missionary organizations, churches and schools worked tirelessly to give the emancipated population the opportunity to learn. Former slaves of every age took advantage of the opportunity to become literate. Grandfathers and their grandchildren sat together in classrooms seeking to obtain the tools of freedom. After the Civil War, with the protection of the Thirteenth, Fourteenth, and Fifteenth Amendments to the Constitution and the Civil Rights Act of 1866, African Americans enjoyed a period when they were allowed to vote, actively participate in the political process, acquire the land of former owners, seek their own employment, and use public accommodations. Opponents of this progress, however, soon rallied against the former slaves' freedom and began to find means for eroding the gains for which many had shed their blood. Thomas Nast's depiction of emancipation at the end of the Civil War envisions the future of free blacks in the U.S. and contrasts it with various cruelties of the institution of slavery. Mustered Out.Prints and Photographs Division. During Reconstruction freed slaves began to leave the South. One such group, originally from Kentucky, established the community of Nicodemus in 1877 in Graham County on the high, arid plains of northwestern Kansas. However, because of several crop failures and resentment from the county's white settlers, all but a few homesteaders abandoned their claims. A rising population of 500 in 1880 had declined to less than 200 by 1910. Standard Atlas of Graham Co. Kansas, Including a Plat Book of the Villages, Cities, and Townships. The Times and Democrat is a daily newspaper in Orangeburg, South Carolina. The Times and Democrat is owned by Lee Enterprises, a company based in Davenport, Iowa. It has a daily circulation of 13,395, and a Sunday circulation of 14,182. What Year did the American Revolution Start?